Efforts must be made to keep seed moist for 5 to 7 days. Seeds can be covered with cardboard or plastic for this time which is a good method to keep seeds moist. Water daily. As germinated seed will need light at about 7 days after sowing uncover them and still keep moist. To get seeds to poke through the soil use a loose soil mix or cover with sand. 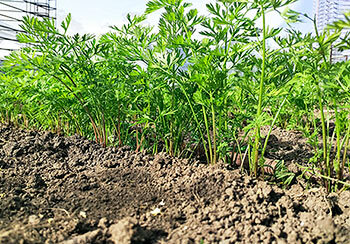 Plant seeds in a V shaped trench about 25mm deep so soil will cover carrot shoulders as they grow. Uncovered carrots will show green colouration and taste bitter. Now that germination has been successful seeds may come up thickly so you may need to thin them. Deep and well dug sandy loam is the best to allow roots to develop fully.